After learning about Mayor Bloomberg’s initiative to make streets safer for New Yorkers by installing countdown timers and other changes in the streetscape, the PASS Coalition wrote to the Mayor at the end of August 2010 about New York City’s obligations under the Americans With Disabilities Act.�The letter outlined the efforts of the coalition and technological solutions that the Department of Transportation might employ. “Members of the PASS Coalition have been asking for New York City to start installing Accessible Pedestrian Signals (APS) for many years,” said Raymon Wayne, the President of the New York City Chapter of the National Federation of the Blind of New York. Accessible pedestrian signals are devices that communicate information about pedestrian signal timing in nonvisual format such as audible tones, verbal messages, and vibrating surfaces.�These devices, when installed at key intersections, can help blind, visually impaired, and deaf-blind people cross streets by making walk signals accessible. “Accessible Pedestrian Signals are really needed for many intersections in New York City,” said Dr. Gene Bourquin, a certified mobility instructor.�“With the number of changes that the city has made to many intersections like complicated phasing patterns for traffic lights, turning lanes, and pathways for bikes, it makes it very difficult for blind pedestrians to cross streets because they don’t have the type of information needed to understand regular traffic patterns.�And the City is planning to make even more changes in coming years,” continued Dr. Bourquin. “All we need is a plan to install accessible pedestrian signals as the City is making important traffic changes,” said Sharleen Kraft.�“We really can’t wait any longer.�It might be too expensive for the city if they don’t act now,” continued Ms. Kraft. Pedestrians for Accessible and Safe Streets (PASS) comprises more than 20 state- and citywide organizations.�These include organizations that work specifically with blind, visually impaired, and deaf-blind New York residents and visitors. 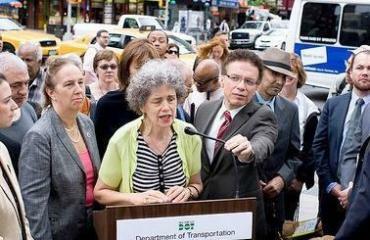 The Coalition also includes organizations whose interests lie in ensuring a safer New York for all pedestrians.